You are quite likely not to have heard of Eleanor Rathbone, a great social reformer; I had forgotten all about her until I passed a blue plaque in London recently commemorating her life. (Tufton Street, London) Eleanor was the prime mover behind behind the introduction of family allowances which were paid to women; there were times in my life as a non’ earning mother of small children when I was exceedingly grateful for that allowance! She was born in 1872 into a Quaker family. After leaving University, Rathbone became secretary of the Women’s Industrial Council in Liverpool and was very involved in the organization’s campaign against low pay and bad working conditions. In 1909 she became the first woman to be elected to Liverpool City Council and over the next few years argued passionately for improved housing in the city. Rathbone established a committee to look into poverty in Britain. In 1917 the Family Endowment Committee published ‘Equal Pay and the Family. A Proposal for the National Endowment of Motherhood’. 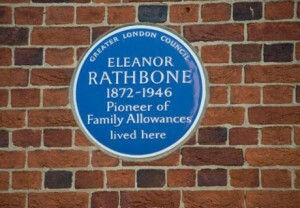 In the pamphlet Rathbone and her colleagues argued for the introduction of family allowances. At the time this was heady stuff! She continued to campaign for social reform and in 1925 published, The Disinherited Family. The following year the introduction of family allowances became a policy of the Independent Labour Party. However, the idea was rejected by the three major political parties; the unions in particular were concerned that the allowance would be detrimental to any pay settlements. In 1929 Rathbone was elected to the House of Commons as the Independent Member for the Combined British Universities. Over the next few years she campaigned against female circumcision in Africa, child marriage in India and forced marriage in Palestine. This included the publication of the book, Child Marriage: The Indian Minotaur (1934). During the Second World War Rathbone continued to campaign for family allowances and in 1940 published The Case for Family Allowances. This became the policy of the Labour Party and her family allowances system was introduced in 1945. However, Rathbone was furious when she discovered that the allowance was to be paid to the father rather than the mother. This negated the feminist implications of the measure and she threatened to vote against the Bill. Eleanor believed very strongly that the best way to alleviate the poverty of women and children was to reduce their dependence on men. Even among the poorest families, it was accepted that a man would keep back some of his wages for himself – whatever the size of his wage packet. A minority went further and kept their families short, preferring to spend their money in public houses even when their children had nothing more than bread and dripping to eat. During the Second World War Rathbone continued to campaign for family allowances and in 1940 published The Case for Family Allowances. This became the policy of the Labour Party and her family allowances system was introduced in 1945. However, Rathbone was furious when she discovered that the allowance was to be paid to the father rather than the mother. This negated the feminist implications of the measure and she threatened to vote against the Bill. Her persistence paid off and in a free vote it was agreed that the benefit should be paid to mothers. A huge coup. Eleanor Rathbone died of a heart-attack on 2nd January 1946, a great social reformer although not well known today. Undeservedly so, in my opinion, as she was a woman who helped change the lives of millions, and a feminist who put her words into actions!